The rise of technology has businesses and organizations maneuvering new ways of providing services to customers and clients in order to improve revenues and increase the bottom line. In Ohio's disability community, groups are using technology to make their services more accessible, like at the Miami County Board of Developmental Disabilities, which employs online psychiatry services to eliminate wait and drive times to visit psychiatrists outside the county. In the Northeast town of Tallmadge sits another example. The Family Child Learning Center (FCLC) provides Early Intervention (EI) services for children with Autism Spectrum Disorder (ASD) through in-person and virtual visits. Made possible through a strong partnership with Akron Children's Hospital and grants received from the Ohio Department of Developmental Disabilities, Dr. Marilyn Espe-Sherwindt and her staff at FCLC focus on providing 20 intense sessions over a 10-week period through the program Virtual Connections. Families meet twice per week to focus on responsive teaching and the Positive Parenting Program. "At first, people are skeptical about 'virtual,'" Espe-Sherwindt says. "Once we have tried it with a family, they are convinced. Families who want this intense program stick with this intense program." "I love talking about Connections," Espe-Sherwindt says. In 2014, she and her team at the FCLC saw a need in the region to provide evidence-based EI services. The traditional EI model in the U.S. is a home visit once a week or every other week where a therapist or service coordinator meets with a family to address concerns and works with the toddler. The Connections framework is based on research showing that early, intense engagement has proven effective in showing positive results for toddlers and prolonged use of engagement strategies from parents. "The family needs all of us. We just add this extra boost, extra support at the moment of diagnosis," Espe-Sherwindt says. "A couple things were very different from how we did EI in the past. One was intensity. Twice a week we wanted to be working with families. We thought that was important not just because of the research on intensity with the toddlers but also supporting change in families." All of the children accessing Connections framework are served through their local EI program and have a service coordinator and local resources on the ground. "We see ourselves as partners with the local system, adding some additional expertise and options to their team. It's a wonderful partnership," she says. 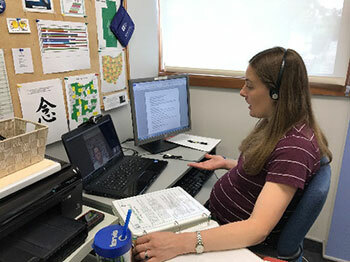 A Virtual Connections appointment consists of a local EI service coordinator visiting a family's home and connecting with FCLC online through a computer or tablet. In the session, parents learn strategies designed to increase the frequency and quality of parent-child interaction, and they focus on increasing the skills needed to communicate with their child more effectively. From July 2015 to June 2016, eight families in four counties received a total of 178 hours of virtual coaching. The average age of toddlers served through both the virtual and in-person Connections program is 20.5 months. Speaking to the benefits of connecting with experts remotely, Espe-Sherwindt mentions a family in which the mother and child lived in Ohio, but the father worked several states away. Because of Virtual Connections, the father was able to interact and learn with his family. "To me, that's really cool." "Families … figure out how to make this work because it is so important to them," Espe-Sherwindt says. "It's a major commitment. I am always impressed by the families."